Chicago vs. New York Hot Dogs: Who's Got the Winningest Wiener? Is it the "dirty water" simplicity of New York's mustard, kraut, and onions? Or the charred-or-steamed kitchen sink of tomatoes, onions, sport peppers, relish, mustard, pickles, and celery salt that is a Chicago-style hot dog? If there's one thing America was founded on, it's the idea that we can (and should) viciously debate for decades and decades over whose regional foods are superior to other variations of the same regional foods. 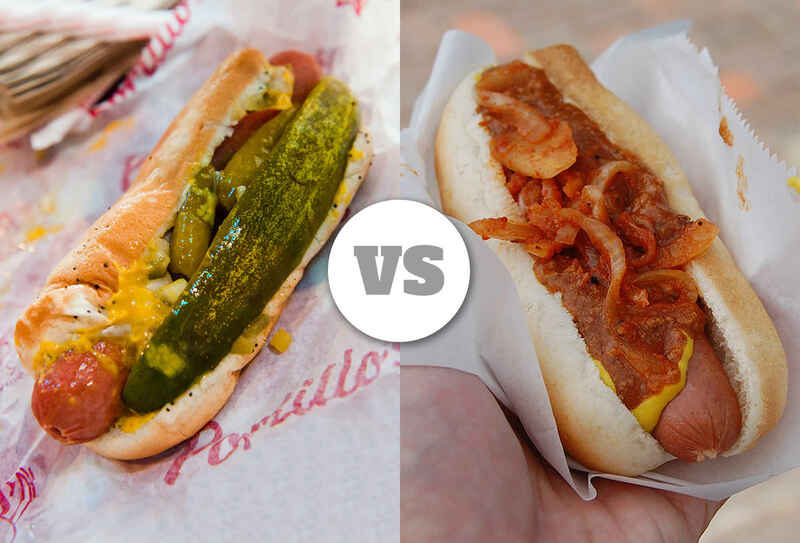 With that in mind, we've decided to tackle an age-old war that's been waged at street carts in Chicago and New York ever since the first American frankfurter was placed in a bun: which city makes a better hot dog? Is it the "dirty water" simplicity of New York's mustard, kraut, and onions? Or the charred-or-steamed kitchen sink of tomatoes, onions, sport peppers, relish, mustard, pickles, and celery salt that is a Chicago-style hot dog? We tapped two of our fiercest writers to rep their cities and weigh in -- and things got hot, dawg. Am I surprised that New Yorkers fancy themselves as the country's premier destination for hot dogs? No, no I am not. They think they have the best everything. Trying to discuss pizza with them is insufferable (and a topic for another day). They're even attempting to co-opt the BBQ crown (cue everyone South of the Mason-Dixon Line laughing uproariously). 1. They have no style. There's a reason you find "Chicago-style hot dogs" on menus all over the country (albeit inferior ones). The flavor parade that is yellow mustard, relish, onion, tomato, celery salt, sport peppers, and a pickle spear is a perfect blend of taste and texture that complements your encased meat without overpowering it. The most iconic New York dog carries the descriptor "dirty water" and comes with a pile of sad sauerkraut and regret. 2. They've been betrayed by their own. Anthony Bourdain lives in -- and loves -- New York. He also loves street meats of indeterminate origin. He openly despises Chicago pizza. When a man with those credentials emphatically declares Chicago hot dogs to be superior to New York's, you know you're fighting a losing battle. 3. We can do the haute dog thing, too. No single place encapsulates the wide-ranging glory of Chicago's hot dog scene like Hot Doug's (for real, watch the clip above). I've eaten at some of NYC's more celebrated dog joints, and they aren't even playing the same sport. From a perfectly executed, cheap Chicago Dog to next-level sausage creations with foie gras and other fanciness, it delivers the goods every time -- even with the hungry hordes lining up outside. Sadly, Doug is closing up shop soon, but we have Franks 'N Dawgs and countless others to carry the torch. 4. We show them more respect. The macabre display of machine-like hot dog consumption that is the Nathan's Famous Hot Dog Eating Contest shames the good name of hot dogs everywhere. Here in Chicago, we eat way too many of them because we lack self-control, not because of some tawdry contest. 5. Because we love them more. Hot dogs are an afterthought in New York. It's a pizza town. I won't get into the NYC-Chicago pizza debate, because, again, New Yorkers are a bunch of closed-minded children who are scared of pizza that's too big for them. 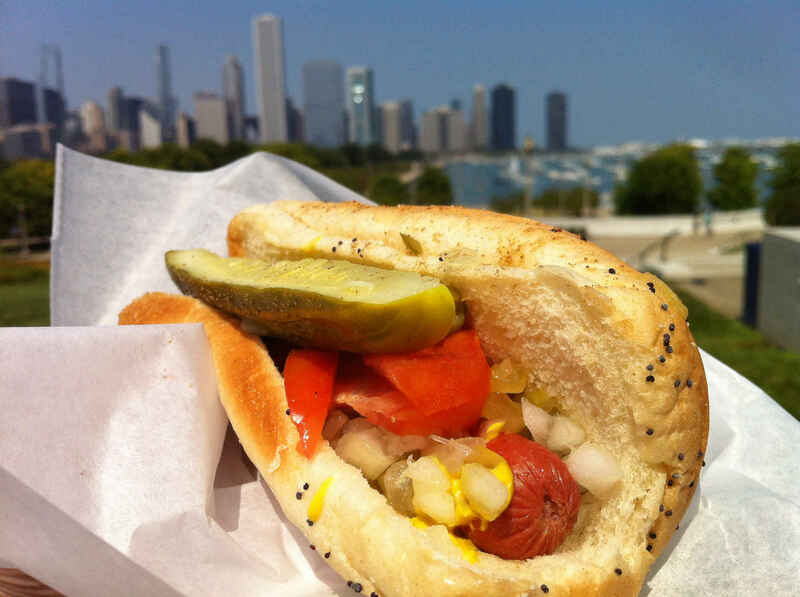 But hot dogs are essential to an understanding of Chicago's culinary scene on a level that simply isn't present in NYC. There are more hot dog joints here than there are McDonald's, Wendy's, and Burger Kings. Combined. So it should shock absolutely no one that we do them much, much better than a certain self-important city out East. Chicago has made its case. See what a New Yorker (and obviously an NY hot dog lover) has to say for himself, only on Thrillist.com!